L-Carnitine has been used as a dietary supplement for athletes and sportsmen who use this compound as a way to lose weight. L-Carnitine is a compound derived from the amino acid Lysine, which is necessary for the transformation of fatty acids in the mitochondria to create energy. Through supplementation, you can obtain greater amounts of L-Carnitine to help you reach your goals. 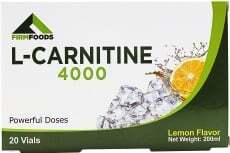 FIRM FOODS PRESENTS L-CARNITINE 4000! L-Carnitine base, the most concentrated form of L-Carnitine. L-Carnitine, used for physical performance, output and weight loss. L-Carnitine promotes hormonal balance appropriate to enhance the activity of the receptor cells. Its ability to promote recovery after high-intensity workouts makes it a powerful tool to help with workouts as well as weight loss. Firm Foods has combined the most complete and powerful formula of L- Carnitine, with 4000mg of L- Carnitine Base, in a plastic funnel for safe and easy transportation, and with a pleasant lemon scent. Try L-Carnitine 4000 from Firm Foods today! It's recommended for all endurance athletes and also for those who practice aerobics, team sports and cycling. Don't miss out on the best body toning and energy maximizing formula! This L-carnitine is brutal for the price. 4000 mg per amp ... This is more than the l-carnitine gold nutrition and the price is much better. Recommend! First of all I didn't buy L-carnitine for weight loss. If I do lose some weight well that's an added bonus! I bought this to give my workouts a boost. I felt I had hit a bit of a wall with my bike training. I'm doing a lot of high intensity intervals and had been really struggling to complete the sessions. So as it turns out I was reading an article on Mo Farah and he had been accused of using massive doses of l-carnitine. So after a bit of research I decided to give it a try. Does it work? Oh yes.. this stuff is the bomb! I'm am now absolutely crushing my bike workouts and this is only my second week of using it. I definitely feel more focused and the biggest difference is my ability to clear the lactate from my legs. It's so good that I won't be telling my cycling friends as this without doubt will give me a massive advantage. Give it a try.. you won't regret it!! Been ussing this 4days now 30 mins before going to my gym i feel the difference im more focus and high endurance i can push myself more. Without the down side of jitter and ligth headed. Definitely one of the best price and highest dose in th market. Cant ask for more. WARNINGS L-Carnitine 4000 : Do not exceed recommended dosage. Keep out of reach of children. The product should not be used in case of hypersensitivity or allergy to any of the ingredients of the formulation. Contain sweeteners. Store in a cool, dry place.